See where wild horses roam and help support and preserve their open range when you take a guided tour of Black Hills Wild Horse Sanctuary, located near Hot Springs, SD. See hundreds of wild mustangs when you take a tour of the Black Hills Wild Horse Sanctuary. Foal sales, donations, tours and gift shop sales help support the sanctuary. Black Hills Wild Horse Sanctuary is part of a non-profit organization called the Institute of Range and American Mustang (IRAM), created by Dayton O. Hyde in 1988. Located near Hot Springs, South Dakota, the sanctuary contains hundreds of wild mustangs that range in herds over thousands of acres of land. Staff and volunteers work hard to ensure that the herd is well cared for and visitors help support the sanctuary by booking guided tours of the sanctuary. Choose from four different tour options and see these gorgeous animals up close in their native range. Visitors may also support the sanctuary by purchasing off-spring foals, making donations, and buying gift shop items. 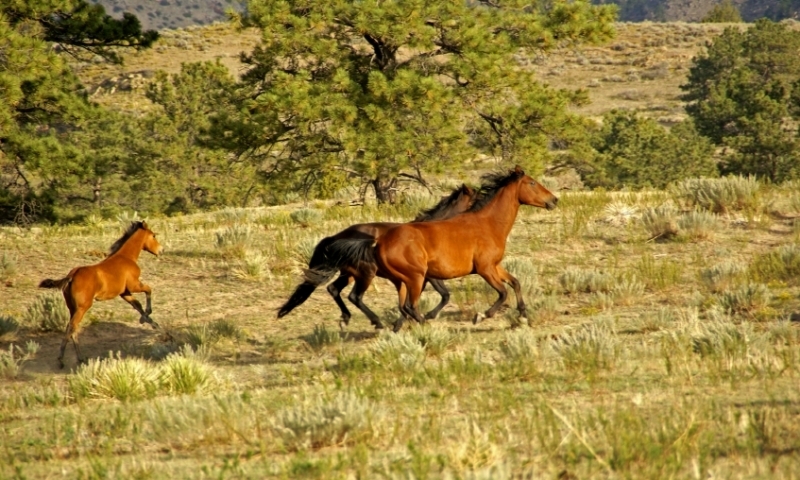 Black Hills Wild Horse Sanctuary is located off Hwy 71 South, near Hot Springs. From Hot Springs, drive 12 miles south on Hwy 71 and cross the Cheyenne River Bridge, keeping a lookout for the Wild Horse Sanctuary road sign. Take a right on Rocky Ford Road and another right onto Highland Road. The Visitor’s Center is located three miles down the road at the top of small hill. Black Hills Wild Horse Sanctuary tours are available year-round. Treat yourself to an adventure of a lifetime while supporting the wild mustang herd when you book a guided tour of the sanctuary. Tours include a wealth of information and commentary by your own personal guide, bus stops for photos, Native American ceremonial sites, Petroglyphs, movie set sites, and an opportunity to see hundreds of wild horses. Choose between a 2-hour, 3-hour, Adventure Tour or Photo Tour. Stop in the gift shop and purchase everything from T-shirts and caps to jewelry, ornaments, books, DVDs, photographs, toys, and post cards. “Horses Helping Horses” is a program that helps support the sanctuary by making herd offspring available for purchase. Proceeds from foal sales go toward providing necessary sanctuary items such as salt licks, hay, and facility equipment. For more information, call: (605) 745–7494. For tours, visitors are encouraged to bring hats, sunscreen, sunglasses, a camera and drinking water. Wear closed shoes or boots. No flip flops or bare feet!